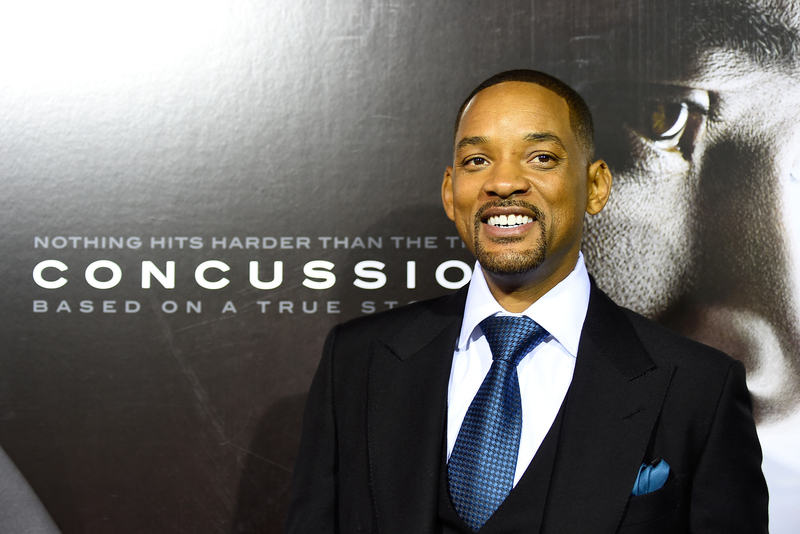 This Thursday morning, Hollywood superstar Will Smith earned his fifth Golden Globe nomination for the based-on-a-true-story sports drama Concussion. He beat out such big names as Johnny Depp (Black Mass) and Tom Hanks (Bridge Of Spies) to land in a crowded Best Actor in a Motion Picture Drama field alongside Bryan Cranston, Leonardo DiCaprio, Michael Fassbender, and Eddie Redmayne. Now the famous actor is already making headlines again — this time for a project of a very different sort. If rumors are to be believed, Will Smith could join the next Batman solo movie to fight alongside the Caped Crusader as the antihero assassin Deadshot. If that name sounds familiar, that's because it's the character that Smith is playing in the upcoming movie Suicide Squad, the second entry in the DC Cinematic Universe next year following March's Batman V Superman: Dawn Of Justice. As Deadshot, Smith will be appearing in Suicide Squad alongside a bevy of other exciting actors, including Jared Leto as the Joker, Margot Robbie as Harley Quinn, Cara Delevingne as Enchantress, Jai Courtney as Boomerang, and Viola Davis as Amanda Waller. When it was announced that Smith would be joining that large ensemble cast, it came as something of a surprise... considering he had just turned down the title role in Quentin Tarantino's Django Unchained a few years earlier, citing fears that Christoph Waltz's character was bigger than that of Django. "Django wasn’t the lead, so it was like, I need to be the lead. The other character was the lead!" the actor told Entertainment Weekly in 2013. Jamie Foxx would go on to fill the part in the Oscar nominated film while Smith made M. Night Shyamalan's After Earth instead. So, Smith's decision to sign on to a film where he not only wasn't the lead, but just one out of a large and colorful ensemble cast, raised some eyebrows. But this latest rumor helps to make sense of the decision. According to Latino Review, sources claim that Smith will be joining Ben Affleck in the latter's upcoming solo outing, which itself will spin off from Batman V Superman to be the first solo Batman movie since Christian Bale hung up the cowl after 2012's The Dark Knight Rises. The offer of a multi-film contract could explain how Warner Bros. was able to convince one of the world's most recognizable celebrities to join their franchise in a supporting role... especially if that contract includes a Deadshot solo movie or two somewhere down the line. The studio currently has their DC slate lined up through 2020, including new solo movies for characters such as Wonder Woman, The Flash, Aquaman, Shazam, and Cyborg. But that doesn't mean they couldn't find room for Deadshot somewhere down the line. Whether Smith gets his own solo film or continues to cash paychecks for appearing in other heroes' adventures, one thing is for sure: DC's lineup is looking increasingly diverse. Their first solo female superhero, Wonder Woman, will hit theaters two years before Marvel's Captain Marvel, and their lineup boasts multiple actors of color including Smith, Davis, Jason Momoa, Dawyne Johnson, Ray Fisher, and potentially Tyrese Gibson as Green Lantern. Right now, rumors of Deadshot appearing in anything other than Suicide Squad are just that: rumors. But turning one of Hollywood's most bankable stars into a headlining superhero seems like the kind of no-brainer move any movie studio would be more than happy to make. Warner Bros. would be foolish to pass up the opportunity — especially if Suicide Squad is well received when it hits theaters on Aug. 5, 2016.